Although the issues I treat are quite often complex, I strive to restore function and improve quality of life for my patients. 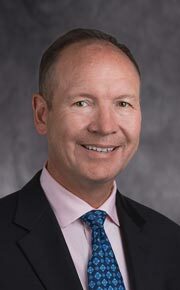 Mark A. Mighell, M.D., is board certified by the American Board of Orthopaedic Surgery, and he serves his profession as a national board examiner. He specializes in the treatment of injuries and disorders of the shoulder and elbow, and, having been trained in an American Shoulder and Elbow Surgeons fellowship, he now trains three fellows each year. Additionally, Dr. Mighell treats patients using advanced surgical techniques including elbow arthroscopy, reverse total shoulder replacement, and shoulder reconstruction. Prior to joining Florida Orthopaedic Institute in 2001, Dr. Mighell served on active duty in the Department of Orthopaedic Surgery at Portsmouth Naval Medical Center for seven years, and as Medical Director for the United States Navy during the previous four years receiving a Navy Commendation for duties performed. He is an active member of the Orthopaedic Trauma Association and American Shoulder and Elbow Surgeon and has received the “Best Doctors In America” award annually since 2007. Multi-lingual in English, Spanish, French, Russian, and German, Dr. Mighell has authored dozens of publications and has delivered numerous poster and oral presentations relating to his medical expertise. His outreach activities include acting as Team Physician to the Plant High School athletic departments, as well as mentoring college students who are interested in studying medicine. Dr. Mighell enjoys spending his free time boating with his wife and three children. He is board-certified by the American Board of Orthopaedic Surgery. I have had Dr. Mark Mighell perform two separate surgeries on me. First, was on my left elbow. In a short period of time I had full use of my left arm. Second, Dr. Mighell repaired a torn rotator cuff in my right shoulder. I chose Dr. Mighell to perform this surgery based on the excellent results I achieved from my first surgery. He along with his professional staff are very personable and listen to all your concerns. I have never left his office with any unanswered questions I presented to him and never felt like I was being “rushed” out of the office. I highly recommend Dr. Mighell to anyone requiring his services. Dr. Mighell did my left shoulder replacement one year ago and I am extremely happy with the result. I have full range of motion and no pain. The doctors and physical therapists at Florida Orthopaedic Institute are the best! Dr. Weinstein and his staff were fantastic! They all spent a lot of time with me, despite how busy the office seemed. Dr. Weinstein went over my symptoms and pain, sent me for an x-ray and showed me the results. He told me what he believes the issue is and we discussed treatment and next steps. I appreciate this honesty and advice. I would recommend him to anyone! I had arthritis of the shoulder from an old injury. I put up with it for years and was referred to Dr. Mighell by another orthopedic surgeon. He recommended a shoulder arthroplasty. Post operation care was great at Florida Hospital for one day and I had negligible pain. Now, four months later, I have no discomfort and full range of motion. Two months after surgery, I went biking in Morocco and rode a camel in the Sahara Desert. As good an experience as one could ask for. Dr. Mighell is a living legend. A rock star of the medical field. Everyone I know that knows Dr. Mighell loves him. Our son had surgery by Dr. Mighell. From the first meeting with him we felt confident that we were in good hands. He and his team did an exceptional job at explaining everything from start to finish. It’s been a couple of months now and from surgery, recovery, follow-up visits to physical therapy, we have been treated with superb professionalism. Thank you Florida Orthopaedic Institute, Dr. Mighell and all involved with our son’s recovery. There is no other doctor that I would go to after having Dr. Mighell as my shoulder surgeon. He is a brilliant doctor and gifted surgeon. He also has an outstanding team working with him. Dr. Mighell performed a reverse shoulder replacement on my right shoulder after years of trauma, injections and suffering with extreme pain. While the surgery was painful with a long recovery process – I would not change my decision. I am free and back to performing all the activities I enjoy doing. Dr. Mighell took his time. He introduced his fellow who also took time with me. The staff was great. Overall, it was a pleasant experience. Thank you. I give a 5 star rating to this business because from the beginning the made all my appointments, surgery, follow ups and therapies very easy for me to schedule. I never had an issue even when I showed up early for appointments. The staff was professional, friendly and kind from the front desk and nurses to the orthopaedic doctor. I recommend Dr. Mighell to everyone that may need an excellent orthopaedic doctor. From the time that we first met he was friendly, very thorough, compassionate, happy and caring. I felt that he was part of my family and a friend. He made me feel relaxed through the whole process. I will miss him. Thanks to Florida Orthopaedic Institute, Dr. Mighell and all the staff involved with my care. Dr. Mighell is the best!! I came to him with a seriously messed up shoulder. I previously had a plate and 8 screws put into my shoulder. After months of physical therapy, the pain in my shoulder was unreal. I couldn’t raise my arm but a few inches. I went to four shoulder surgeons before Dr. Mighell, and they all said that my case was too advanced for them. Dr. Mighell agreed to help me. Reverse shoulder replacement. 8 week post-op and I’m pain free and can do 80% of what I did prior. He’s so AMAZING! Dr. Mighell performed rotary cuff surgery on my right shoulder. I am pleased with my overall experience from the pertain to postcare. Dr. Mighell has a dynamite personality and I love that he wears jazzy socks! This visit was one of a kind. I was so impressed with the Doctor and his staff! After being told by several doctors that I needed a full shoulder replacement, I was referred to Dr. Mighell. During my appointment, he was very personable. My surgery could not have gone better! If you are considering shoulder surgery, do yourself a huge favor and make an appointment with Dr. Mighell. It will be one of the best decisions that you could ever make and you will greatly enjoy his staff. Dr. Mighell is one of the nicest, most kind, caring men I have known. His staff is just like him, always ready to help or answer any questions. 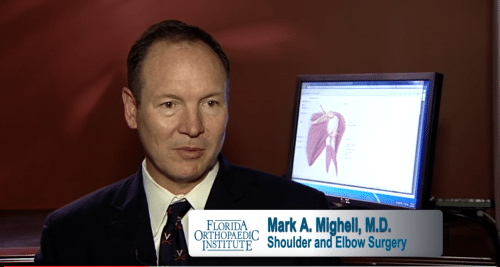 I suffered a torn bicep tendon six months ago and sought out the help of a highly recommended orthopedic surgeon, Dr. Mark Mighell, at Florida Orthopaedic Institute. This was my very first surgery where I had to receive general anesthesia. So to say the least, I was a bit nervous. When I met Dr. Mighell, he calmed my nerves and explained the procedure in detail. He fit me into his schedule early and performed a distal bicep repair with no complications. I went through the recommended physical therapy and now, six month post operation, I am 99% back to my full range of motion with no limitations. Dr. Mighell and his nurse, Rita, treated me with the utmost respect and care throughout this entire process. I would highly recommend Dr. Mighell if you have any orthopedic injury of your own. Also, I am a registered nurse with sixteen years of operating room experience. Thank you, Dr. Mighell!! Thank you for another successful shoulder replacement surgery! At five and a half months post-surgery, I am able to do anything I want with both arms and experience no pain. Of course, exercising has been key. From a USAF/NC Veteran and a retired operating room nurse, I know you will give many more patients the gift of pain free movement for years to come. I am so glad I chose you for both my shoulder replacements at 75 and 85 years of age. Dr. Mighell’s surgical skill for my right shoulder replacement have been excellent. Dr. Mighell and his staff have answered all of my questions and have been available to me whenever needed. The hospital entrance staff, nurses, pre-operative, and post-operative personnel were excellent and caring. Even the hospital room and nursing staff were top notch. I cannot say enough nice things about the entire process. This was my seventeenth surgery in my lifetime and I can say that it was the best. Thank you, Dr. Mighell, and your entire staff, both at the office and hospital! I have had RHA since I was 5 years old, I am 59 now. I have had two joint replacement surgeries on my right shoulder, and unfortunbately, I broke it again. Dr. Mighell said he would do my surgery, but was skeptical because I did not have much bone left from the other two surgeries to connect the prosthetic to. He performed the surgery with skill and expertise. I can raise my right arm high enough to use the hair blower to style my hair. It has been 12 years since my surgery and my arm is still doing great. Dr. Mighell is one of the best! I thank God for intelligent, dedicated and skilled doctors like Dr. Mighell. Dr. Mighell gave me back my arm! I had a joint replacement in my right elbow from a car accident. The surgery Dr. Mighell performed gave me back 90% of the function I had. I cannot say enough about FOI’s Dr’s & staff! On Oct. 23, 2014, I fell in my home and broke the humerus bone in my left arm. My first trip was by ambulance to a hospital in north Tampa where, after a trip to the OR, I was told that the bone was in place and I was sent home in a brace. The next morning, I was in such pain that my husband and I again called 911, requesting that I go to another hospital. My arm WAS NOT in place and the brace was cutting off circulation to my hand because of extensive swelling. Had we not gone to this hospital I believe I could have lost my arm. The sad part of what happened at the second hospital was that I was, again, told that my bones were in place and sent home. They were not. After 3 more days of excruciating pain, my husband, being a physician himself, scheduled an independent x-ray confirming what we already knew. My husband is a very well respected family practice physician in Tampa, taking care of his patients for over 25 years now and, yet, he was at a loss. As a last resort, we called Dr. William Carson who had performed surgery on an ACL tear I had many years previously. Without a moments hesitation, I was referred to Dr. Mighells. This incredible man had me in surgery within 3 days, and without doubt, saved my arm! Mine was a very complicated case involving permanent nerve damage. We are confident that I will have full function of my arm given time for the nerves to heal. Forgive me for this lengthy testimonial, but I cannot say enough in my thanks to this incredible surgeon and those that work under him. He’s the best in his field. Period. If anyone interested would care to speak with me about my experience, I would be more than happy to do so.